A charged argon gas in the fluorescent lamp emits Wi-Fi signals. 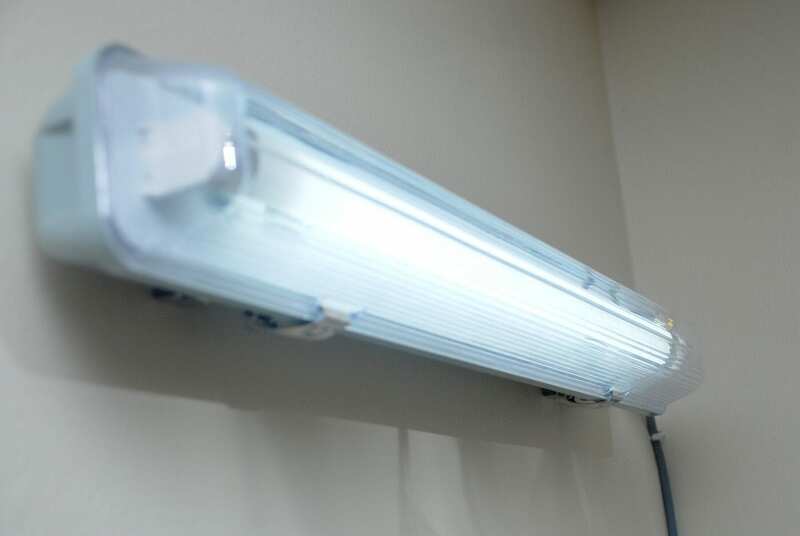 A new invention uses ionized gas in fluorescent light tubes to transmit Internet wireless frequency signals throughout a building with the aid of already existing electrical wiring. Due to continuously evolving applications, the electronic communications industry requires high performance and speed efficient systems. However, the physical limitations of microwave devices limits further improvements in current technology. This predicament has led to growing interest in the use of plasma as a conductive element in microwave devices due to their unique and innovative properties, which corresponds with traditional metallic antennas. Matter exists in four different states: solid, liquid, gas and plasma. Plasma is a type of gas in which the atoms are ionized – they have both free negatively charged electrons and positively charged ions. These charged particles can be controlled by electromagnetic fields, allowing plasmas to be used as a controllable reactive gas. This invention employs an ionized gas enclosed in a tube as the conducting element of an antenna. When the gas is electrically charged or ionized to plasma, it becomes conductive and allows radio frequency signals to be transmitted or received. When the gas is not ionized, the antenna element ceases to exit. The invention features a smart fluorescent antenna with a 3G/3.75G/4G router for Wi-Fi applications. The antenna operates at the 2.4 GHz frequency band, which is suitable for Wi-Fi applications. A commercially available fluorescent tube, measuring 0.61 metres in length by 0.25 metres in diameter, is used as the plasma antenna. The gas inside the tube is a mixture of argon and mercury vapour, in the ratio 9:1. The tube is energized by a 240 V current, provided by a standard AC power supply. A glowing tube indicates that the gas inside the tube has been ionized to plasma and forms a plasma column. In this state, the plasma column becomes highly conductive and can be used as an antenna. A coupling sleeve is positioned at the lower end of the tube, which is used to connect the plasma tube to the router. The function of the coupling sleeves is to store the electrical charge. When the gas inside the tube is sufficiently ionized into a plasma state, it becomes conductive and allows radio frequency signals to be transmitted or received. Measurements indicate that the plasma antenna yields a return loss over 10 dB in the 2.23 GHz to 2.58 GHz frequency band. The antenna’s ability to operate as either a transmitter or receiver in this particular frequency band was verified through a series of wireless transmission experiments. April 17, 2019 - (2019-2025) Global Smart Antenna Market Insights Report 2019 – Airgain, Molex, NovAtel, Trimble Navigation Automotive Market ResearchGlobal Smart Antenna Market 2019 Growth Analysis, Share, Demand by Regions, Types, and Analysis of Key Players Research Forecasts to 2024. April 17, 2019 - (2019-2025) Global RFID Smart Antenna Market Insights Report 2019 - Honeywell, Impinj, Zebra Technologies, Abracon - Connectivity Market Connectivity MarketGlobal RFID Smart Antenna Market 2019 Growth Analysis, Share, Demand by Regions, Types, and Analysis of Key Players Research Forecasts to 2024.